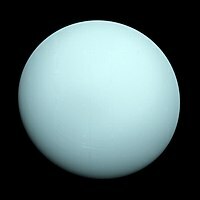 Uranus is the seivent planet frae the Sun. It haes the third-lairgest planetary radius an fowerth-lairgest planetary mass in the Solar Seestem. Uranus is seemilar in composeetion tae Neptune, an baith are o different chemical composeetion than the lairger gas giants Jupiter an Saturn. For this reason, astronomers whiles place them in a separate category cried "ice giants". Uranus's atmosphere, altho seemilar tae Jupiter's an Saturn's in its primary composeetion o hydrogen an helium, contains mair "ices" sic as watter, ammonie, an methane, alang wi traces o hydrocarbons. It is the cauldest planetary atmosphere in the Solar Seestem, wi a minimum temperatur o 49 K (−224.2 °C), an haes a complex, layered clood structur, wi watter thoucht tae mak up the lawest cloods, an methane the uppermost layer o cloods. In contrast, the interior o Uranus is mainly componed o ices an rock. It is the anly planet whose name is derived frae a figure frae Greek mythology rather than Roman meethology lik the ither planets, frae the Latinized version o the Greek god o the sky, Ouranos. Lik the ither gas giants, Uranus haes a ring seestem, a magnetosphere, an numerous muins. The Uranian seestem heas a unique configuration amang the planets acause its axis o rotation is tiltit sideways, nearly intae the plane o its revolution aboot the Sun. Its north an sooth poles tharefore lie whaur maist ither planets hae thair equators. In 1986, images frae Voyager 2 shawed Uranus as a virtually featurless planet in veesible licht wioot the clood bands or storms associated wi the ither giants. Terrestrial observers hae seen signs o saisonal chynge an increased wather activity in recent years as Uranus approached its equinox. The wind speeds on Uranus can reach 250 meters per seicont (900 km/h, 560 mph). ↑ 1.0 1.1 Lunine, Jonathan I. (September 1993). "The Atmospheres of Uranus and Neptune". Annual Review of Astronomy and Astrophysics. 31: 217–263. Bibcode:1993ARA&A..31..217L. doi:10.1146/annurev.aa.31.090193.001245. ↑ Podolak, M.; Weizman, A.; Marley, M. (December 1995). "Comparative models of Uranus and Neptune". Planetary and Space Science. 43 (12): 1517–1522. Bibcode:1995P&SS...43.1517P. doi:10.1016/0032-0633(95)00061-5. ↑ 3.0 3.1 Smith, B. A.; Soderblom, L. A.; Beebe, A.; Bliss, D.; Boyce, J. M.; Brahic, A.; Briggs, G. A.; Brown, R. H.; Collins, S. A. (July 4, 1986). 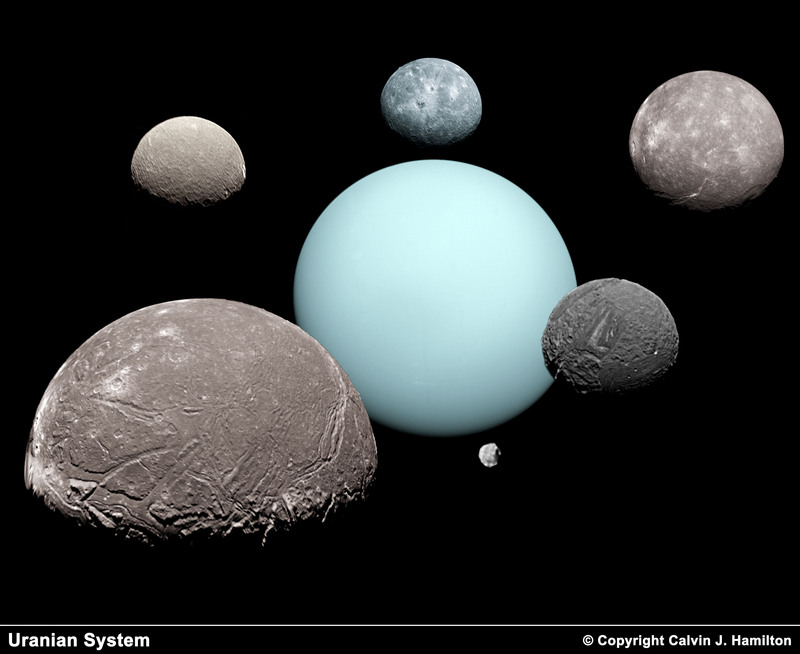 "Voyager 2 in the Uranian System: Imaging Science Results". Science. 233 (4759): 43–64. Bibcode:1986Sci...233...43S. doi:10.1126/science.233.4759.43. PMID 17812889. ↑ Sromovsky, L. A.; Fry, P. M. (December 2005). "Dynamics of cloud features on Uranus". Icarus. 179 (2): 459–484. Bibcode:2005Icar..179..459S. doi:10.1016/j.icarus.2005.07.022. Planets – Uranus A kid's guide tae Uranus. Solar Seestem → Local Interstellar Clood → Local Bubble → Gould Belt → Orion Airm → Milky Way → Milky Way subgroup → Local Group → Virgo Supercluster → Pisces–Cetus Supercluster Complex → Observable universe → Universe Each arrow (→) mey be read as "within" or "part o". This page wis last eeditit on 16 Februar 2018, at 07:06.